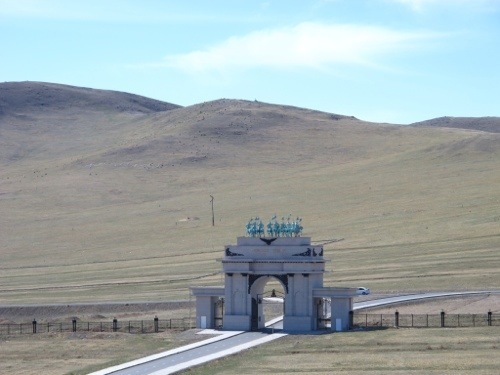 Stainless Steel gleaming, shining bright on this sunny day just 50 kilometers out of Ulaan Bataar, Mongolia. The world’s largest equestrian statue is right here. 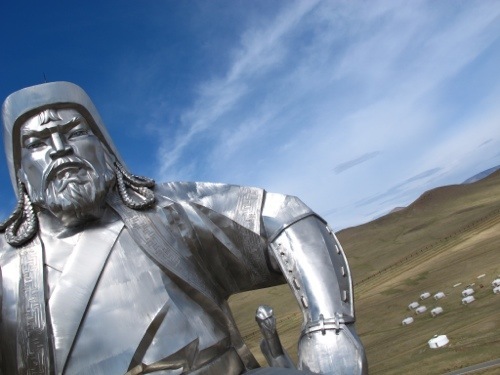 Chinggis Khaan looking like the fierce warrior he was, ruling over what was once the world’s largest contiguous empire! Look at those kids run, imagine them screaming……… Chinggis must be amused! World’s Largest Equestrian Statue. And in stainless steel! Unlike the old temples and museums in disrepair we visited in Ulan Bator, this giant equestrian statue is new, modern and very impressive. It also chose its site (allegedly where they found the golden whip) very well. Unobstructed, it was quite a sight from a distance. 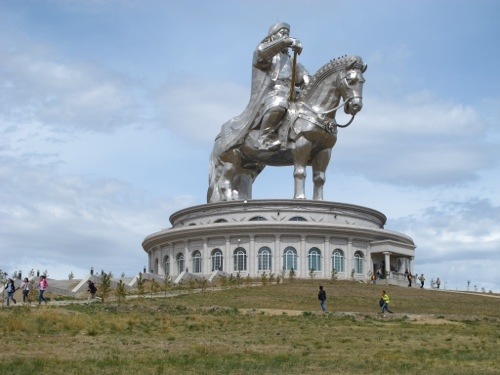 We took the elevator through the horse’s tail, then walked towards the horse’s head where we came out to see Chinggis Khaan and his golden whip up close. Around the giant statue are the sacred mountains, vast fields where animals graze, and a cluster of gers. 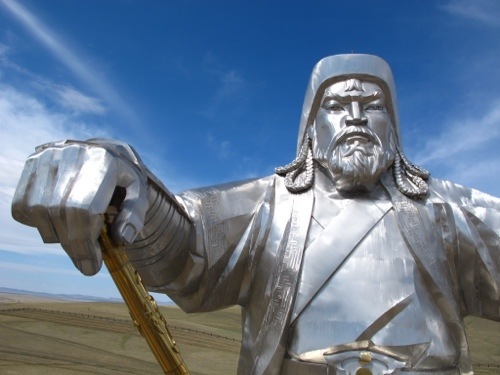 Chinggis Khaan and His Golden Whip. Allegedly, the golden whip was found somewhere here. 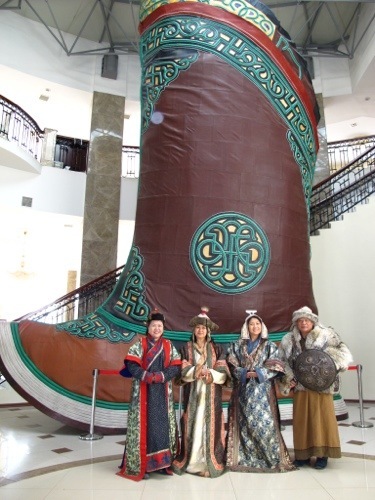 One of those fascinating tales from Mongolia! See that ger camp? I won’t be surprised if the giant equestrian statue is soon surrounded by MORE gers in the coming years. 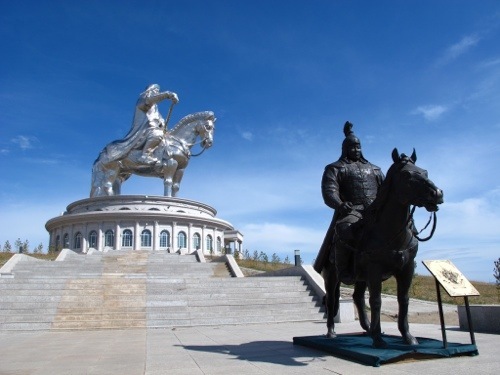 Inside, there are 2 museums dealing with the Great Warrior, his Mongolian empire, some artifacts, and more. We were lucky to get admitted just when a batch of teens were leaving…… And to exit just when a batch of kids were admitted. The latter group ran around like their energies were at an all time high. By the time they stepped outside, they were screaming and running like some monster was chasing them. Kids! On your way to the statue, you’d likely stop to take these photos of livestock grazing. 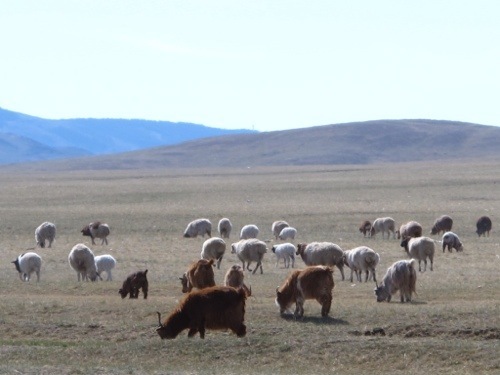 Lambs, goats, yaks, horses, cattle having a reunion! Attila the Hun and his concubines? Fierce warrior he may be, but Attila didn’t die fighting. Rather, he died drinking and choking. And right on the night of his marriage! He drank, collapsed, nosebled and choked on his own blood. Just like that…… Tsk Tsk . Yes, happy to strike that off my list, and now. I think much will change in the next 5 years — where more (younger) Mongolians will drop their nomadic lifestyle and the rugged landscape will give way to modern skyscrapers. I’m sure you’d take better photos than I did. Mongolia is fast-changing and I’m glad we went when we did. Thanks for dropping by!